JEE Advanced Seat Matrix 2018: JEE Advanced 2018 exam is over now and students are eagerly waiting for the release of answer key and their result. After it, the JEE Advanced counselling procedure will be organized. Through the JEE Advanced Counselling, the JEE Advanced Seat Matrix in IITs will be allotted by JoSAA to the eligible and qualified candidates. The seat will be allotted in 23 IITs Institutes having almost 11000 seats. In this Article, we are going to list down all the IITs institutes which are offering seats through JEE Advance exam, available seat details, and Procedure of seat allotment. There are 23 IITs Institutes or functioning in India. Last year these IITs functioning offered 10988 seats through JoSAA or JEE Advanced Exam. This year the availability of seats are expected to be increased by 10%. There will be no major changes in the Institutes and offered seats so we are providing the JEE Advanced Seat Matrix which is based on Seat Matrix of 2017. JoSAA will conduct seat allotment procedure in total 7 Rounds. So candidates have to clear all these rounds to get admission in their preferred institute. Here are the complete procedures of Seat allotment which will cover Documents, Choice Filling, seat allotment details etc. Candidates have to visit the official website and Enter their JEE Advanced 2018 Roll Number, registration number, Date of Birth as per their admit card and their Password on their field. After it, they need to click on confirm the password, and Click on submit, and they are now registered. After logging in they have to fill the choices according to your their preferences. They can edit, reorder, and add new (As Many) choices till the final locking. After filling and rechecking their choice, they must lock their choices before the last date, otherwise, their choice will be automatically locked. JEE Advanced counselling and seat allotment will be conducted in 7 rounds. Counselling and Seat Allotment will be held based on the All India Ranks (AIRs) of candidates. After choice filling procedure, all the eligible and qualified candidates will be allotted seats for admissions to IITs. Seat allotment will be conducted in 7 rounds and at the end of every round or seat allotment/counselling, the candidates must have to check their seat allotment result. Candidates have to be careful due to the up-gradation of their seats and status. After it, On the next page, they can check their Seat Allotment details. 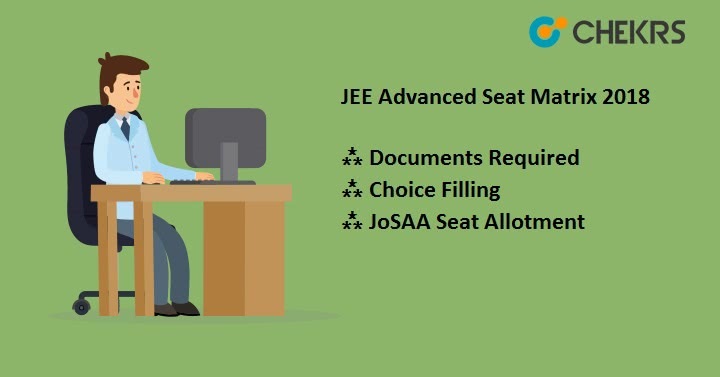 Candidates also have to take a print-out of JEE Advanced 2018 Seat Allotment letter from JoSAA portal. This will be required at the time of reporting and document verification. This procedure also requires the candidates to get the soft copy of their category certificates verified. If It found unacceptable, candidates will be considered as GEN.
To accept their allotted seats, candidates will have to pay the required fee online. After the payment candidates have to report at the allotted institute, to claim their allotted seat and to book it for the academic year. Candidates must have to carry the following documents in original along with one attested copy of each during the physical verification and reporting to get admission into the allotted institute. These documents will be verified during the physical verification and reporting to get admission into the allotted institute. Candidates have to fulfill the fitness and health parameters to get admission into programs like Mining Engineering and Mining Machinery Engineering and other related courses. Degree from IITs has a great worth compared to any other degree in India. Through JEE Advanced exam 2018, All eligible and qualified candidates have the opportunity to get a world-class education in some very reputed Institutes. Grab this Opportunity but I will suggest you to observe JEE Advanced Seat Matrix 2018 before choice filling procedure.